The new PENTAX K-01 is another bold effort in camera design, developed in line with Mr. Newson's three design themes - TIMELESS, TRUSTY and TOUCHABLE. At the same time, it provides the full array of advanced functions and user-friendly features expected from digital SLR cameras. The optical viewfinder and quick-return mirror were eliminated to allow more freedom in designing the camera body. The result is a camera that shows Mr. Newson's originality in every detail, with meticulous attention paid to all body parts to faithfully reproduce his designs. His design scheme has also been applied to the new smc PENTAX-DA 40mm F2.8 XS unifocal interchangeable standard lens - the world's thinnest interchangeable lens, to be launched in the market simultaneously with the PENTAX K-01 camera body - to make the lens-mounted K-01 a complete design package. 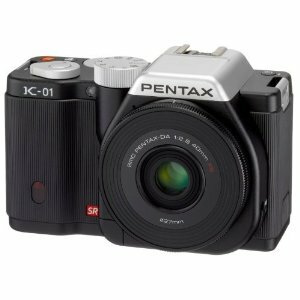 The PENTAX K-01 comes with outstanding basic specifications, including sharp, high-resolution images captured by approximately 16.28 effective megapixels, high-speed burst shooting, an extra-wide sensitivity range with a top sensitivity of ISO 25600 (when expanded), and Full HD video recording. In addition, it features the reliable, ever-popular PENTAX K lens mount, so users can make effective use of their entire lens stock - even lenses produced for film-format SLR cameras. While the K-01 makes the perfect choice for start-up digital interchangeable lens camera photographers looking for an easy-to-operate camera, as well as those who demand originality and stylishness from their imaging tool, it also can be a wonderful second camera for current PENTAX digital SLR users who find pleasure in totally new photographic styles that only the K-01 can offer. Follow the link for more details of this camera, and to get a fabulous £340 OFF! !